The Dingos participated in Toronto's annual St. Patrick's Day Parade on March 13th to celebrate the Irish members of the club and promote the sport of Aussie Rules. 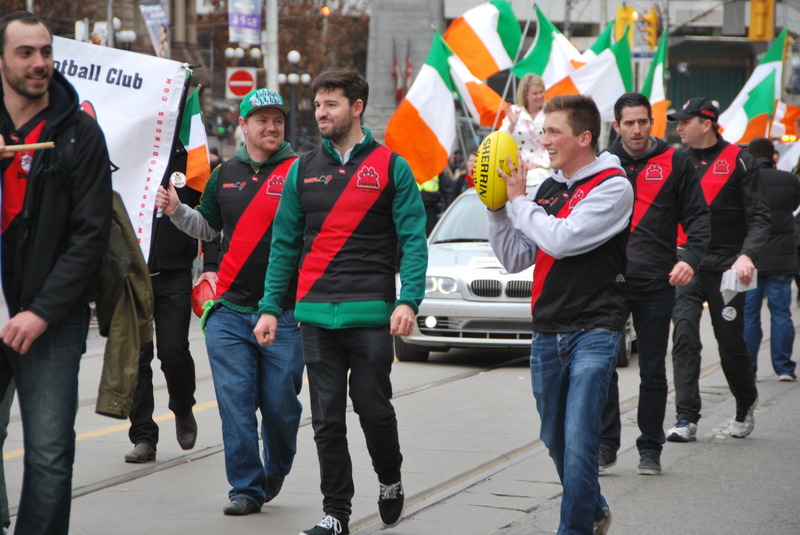 In what was a successful social and promotional event for the club, sixteen Dingos marched in the parade, including four members of the club's Irish contingent. Showing off skills, carrying banners and distributing information cards and stickers, the Dingos marched through the University of Toronto, east along Bloor Street, south down Yonge Street and finished on Queen Street outside City Hall before heading to The Office Pub. The Dingos are proud to have strong Irish connections, with our numbers growing every year and many former Dingos also hailing from the Emerald Isle.